The Philosophy of Fear, or, San Jose State needs to get a grip. Most of the conversation about online learning right now is centered around the MOOC. No relation to the Moog synthesizer, and as Wikipedia helpfully points out, “not to be confused with mook,” MOOC stands for massive online open course. Basically, what this means is that a college professor somewhere records all of his or her lectures and notes and makes them available for free to the public. Awesome, right? The tricky part is that students tend to drop out before completing their first assignment, which is not too surprising given the low buy-in of 0 dollars and the fact that most of these courses, in the current arrangement, do not provide for much teacher-student interaction or support. This is what a MOOC might look like. 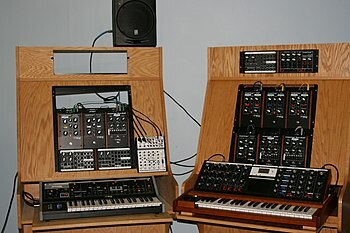 This is a Moog synthesizer. Recently, despite these criticisms, the California State University system has started to seriously consider adding online options in order to provide access to courses to students who would otherwise be shut out due to budget cuts. San Jose State is leading the fray, partnering with the local tech start-up Udacity and the educational technology nonprofit edX (the same one whose essay-grading software I criticized last month) to start providing some remedial courses as MOOCs on an experimental basis. According to The New York Times, these courses will be provided to students at a cost well below the in-state tuition fee and will involve the direct participation of the on-campus professor of record. And yet, the San Jose State Philosophy Department recently unleashed a scathing diatribe against the idea of offering these online courses, stating that this move was tantamount to “the dismantling of public universities” (New York Times 5/2/13). Hyperbole aside, I do appreciate their concern. I see major problems with privatizing public education, or rather privatizing it further than it is already (fodder for another post, another day). But in this case, the Philosophy department should have recognized its own straw man fallacy. One of the main criticisms being lobbed is that the course would require professors to provide someone else’s lectures, and thus teach someone else’s viewpoint. And yet, again according to this article, professors are not required to use the edX materials, which just so happen to have been created by a well-known Harvard professor. The State professors are free to create and use their own materials, recording their own lectures for students to watch on their own time. So the issue they are clamoring about does not actually exist. Straw Man, meet Aunt Sally. Instead, what is really happening is that a top professor from a top university is offering his lectures, for free, to students and professors at San Jose State. These lectures are theirs to use, or not use, as they see fit — a gift from one of the nation’s wealthiest universities to one of its poorest. How is this different from using a chapter of a textbook written by another professor, or even providing an article written by another as required reading? Can a professor not show a lecture, or segment of a lecture, and ask their students to debate its contents, to discuss the extent to which they agree or disagree with this individual’s view? What I see here is not a legitimate fear that online teaching might undermine quality education, but rather a resistance on the part of traditional education to adapt to a changing world and a changing student body. This is a resistance of fear, not of legitimate concern for educational priorities. “(San Jose State Provost) Dr. Junn said she had e-mailed the philosophy department on Wednesday, the day she learned of the letter, to ask whether anyone wanted to discuss it, but was told there was no need, since the letter was mainly meant to raise the level of discussion” (New York Times 5/2/13) (emphasis added). There was no need to discuss the letter, as it was mainly meant to raise the level of discussion. Said the San Jose State Philosophy Department. Circular argument, meet begging the question. In all seriousness — the move into for-credit, public online education, is one that must be made cautiously. There must be careful attention paid to the quality of instruction and participation, the protection of academic and intellectual freedoms, and student outcomes above all else. But fear-mongering and hyperbole will not further the conversation. Unless, that is, this was all meant as a high-concept educational activity in which students are intended to identify the various logical fallacies being employed by both parties. A “teaching moment,” you might call it. And yet, I have a feeling this letter was written in earnest, a cri de coeur from a group of educators who fear to tread in the future. And yet, ready or not, here it comes — our state universities can either compete with the private, online schools on their own turf, or they can continue to resist change and allow themselves to lose the race. I suppose you know by now which side I fall on. This entry was posted in Teaching and tagged E-learning, Education, Massive open online course, online school, online teaching, Professor, San Jose State University, Student, student engagement, virtual education on May 3, 2013 by esimmeth. Once upon a time, people also feared this new technology would destroy our capacity for interpersonal communication. Traditional Educator: Are you able to see your students, and can they see you? Me: Yes, we do have webcam capability, but I find it tends to be more distracting than useful so I tend not to use it. Traditional Educator: How are you able to teach without seeing each other? How do you know if they’re working if you can’t see what they’re doing? Me: Well, I am able to interact with my students in our live sessions through a virtual whiteboard and application sharing, and I get a pretty good idea of who is working and learning by assessing their work, just like in a traditional classroom. Traditional Educator: But, how are you able to make connections with your students? It’s impossible to make real, meaningful connections over the Internet where you can’t even look someone in the eye. Me: You’re right, it’s harder to connect online, but it’s not impossible. You have to be creative and flexible in order to create connections in online teaching, but I find some students actually find it easier to connect and relate with adults from a distance without the social context which they can sometimes find overwhelming. Traditional Educator: I don’t think it’s healthy, being on the computer all day long. Me: I agree, I think it works best for students who have something else that they are involved in outside, such as sports, the arts or a group activity. I do worry about the ones who say all they do other than school is play World of Warcraft. But the truth is that many of these students are going to be sitting at computers all day in their future careers, and learning to communicate and make connections in an online setting is going to be an essential skill. OK, so, this was the fantasy version of the conversation, but it is pretty close to the real thing that plays out every time I feel I have to defend what I do to someone who is unfamiliar with, and perhaps suspicious of, the idea of online education. And I must admit to seeing a great deal of validity in their concerns, enough so that these are the very issues I am personally grappling with as an online educator. How do we make meaningful connections in an online setting? How do we motivate students to participate and engage in learning? How do we make sure students are getting adequate socialization and learning skills like cooperation and teamwork? What do we do to re-engage those students who are tuning out and likely to drop out (with nothing to “turn on” to besides the TV or video games)? But then there are far more students who come to the table with far less. They are academically unprepared, perhaps years behind grade level in basic skills. Their parents want them to succeed but are unable to provide the support they need for various reasons: working two jobs, family chaos, personal issues…Online school, by its nature, attracts those students who are not being served by a traditional public school, and so a large number of our students are under-served and under-prepared. They do not know how to access the systems and they are afraid to ask for help, or they don’t know they need help. They don’t attend the live sessions, or they do but don’t participate. The work doesn’t get turned in, even after the student has *promised* that this time, they will get it done. Emails, phone calls, text messages go unanswered (anyone know where you get a carrier pigeon?). I ask myself, in a traditional school, would it be any different? There would still be those students who wouldn’t show up for class, who wouldn’t do their work, and who would fail out. So perhaps, as I have said before, the problems we see in the online school are no different from the ones that exist in the traditional school, just amplified by our particular setting and its challenges. What I do know for sure is that online school isn’t going to go away — in fact, our enrollment skyrocketed this year and will likely continue to do so. We are a school setting under construction, trying to find our way. But in the meantime, there are real, live students learning online, and they do want to make meaningful connections with their teachers — they just need teachers who are willing to learn how to connect and communicate in the way that works for the student, not just for the teacher. This entry was posted in Teaching and tagged communication, Distance Learning, E-learning, Education, Educators, high school, Learning, online school, online teaching, Relationships, Student, student engagement, virtual education, Virtual school on April 23, 2013 by esimmeth. Yesterday I spent an hour or two doing one of the more monotonous parts of my job: calling and leaving messages for students who are not doing their work and are therefore failing their classes. This is monotonous mainly because the vast majority of phone calls I make go straight to voicemail, if they get through at all — a lot of our families use pay-as-you-go phones that get cut off frequently, or they never set up the voicemail, etc. And even when the call does get through, it gets exhausting being the bearer of bad news over and over. So yesterday after a few dozen of these frustrating calls, I sent out a simple email to all my students who are passing my classes — just a few words saying, hey, good job, I know it’s not easy, keep up the good work. It made me feel a little better just delivering that positive message, but I didn’t think much of it at the time. This morning, I opened my inbox to find a sweet message from a mom of a student who got that email from me yesterday. She said that her son responds really well to praise and she thanked me for knowing how to motivate him. It was a simple, earnest message, and I instantly felt what I hope my students felt when they got my email yesterday: a smile came over my early-morning un-caffeinated face, and I sat up a little straighter on my exercise ball/chair as I plowed on through the rest of my inbox. That mom’s email probably took her just 30 seconds to write, but it made my morning and set me up to have a great rest of the day. Words truly are powerful. This is never more true than in the online school setting where our words are all we have to make a connection with our students. How will you make someone’s day today? This entry was posted in Teaching and tagged communication, Education, Educators, online school, online teaching, student engagement, virtual education on April 10, 2013 by esimmeth.